The bottom photographs in this series of New Mexico Figwort (a.k.a. Red Figwort or Mimbres Figwort) - Scrophularia macrantha (Green ex Stiefelhagen) were taken on October 11, 2013, in Railroad Canyon of the western Black Range. In the past this species has been known as Scrophularia coccinea (Gray) and S. neomexicana (Shaw). The US Fish and Wildlife Service considers it to be a Species of Concern, as does the State of New Mexico. The US Forest Service and the US BLM consider it a Sensitive Species. Natural Heritage of New Mexico considers the species to be Imperiled. Russ Kleinman, the editor of the excellent website - Vascular Plants of the Gila Wilderness - has also photographed this species in Railroad Canyon in 2008 and 2011 (in mid-September in both cases). All of that sounds pretty sensational, but what does it mean. As a point of reference, Natural History of New Mexico considers a species imperiled when it is very vulnerable to extirpation from New Mexico. 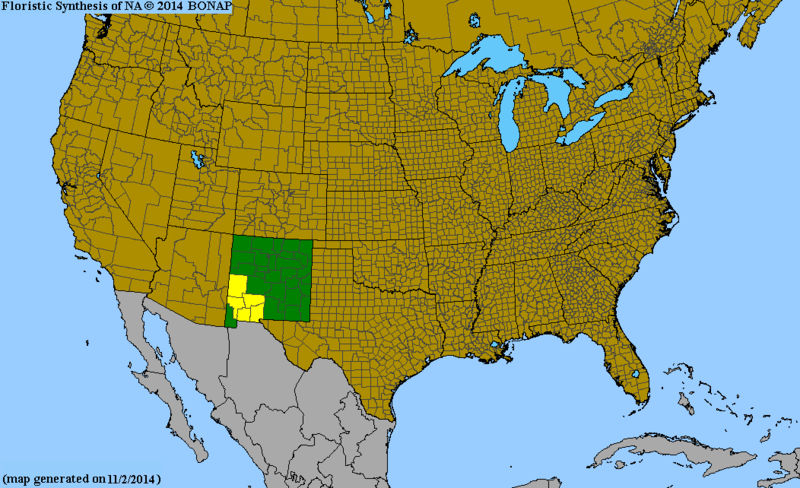 Since this species is found only in scattered locations in a few counties in New Mexico, and nowhere else, that means very vulnerable to extinction in this case (see BONAP map to the right - the yellow color indicates that the species is rare) . They generally make that assessment when there are 6 to 20 occurrences (locations where it is found) or between 1,000 and 3,000 individuals. This information from New Mexico Rare Plants. There are rarer plants in Sierra, Luna, and Grant counties - where we generally hang out - but seeing this one was quite unexpected, and exciting, for us. The specimen shown at the bottom of this page is the type specimen collected near the summit of Santa Rita del Cobre, New Mexico by Charles Wright in 1851-1852. Railroad Canyon on October 11, 2013.